Activating Propertybase Webservices gives you access to several powerful features like Weblisting Services, WebToProspect, Front Desk and Facebook Lead Ads Integration. This guide is for Propertybase Administrators with a solid understanding of the Salesforce.com platform. Please note that Lightning customers do not need to activate webservices to use Front Desk or related integrations. Note: You must request an additional (free) site license before activating webservices. Please email Propertybase support and include your Propertybase ID to request your complimentary site license. Have your complimentary site license? Wearing your webservices configuration hat? Great - let's get started. Note: If you haven't previously registered a public API site, click here to do that now. Next, we need to update the access settings for our API site. Scroll to the bottom of the page and click the name of your PB public API site. Using the right arrow button (Add), move those selected below to the Enabled column. Next we need to repeat that same process for the Apex Classes. Click the arrow next to Visualforce Page Access, then click Apex Class Access. Note: Continue to the next step by scrolling to the top of the page and selecting the next tab. Next we will make sure all objects have the correct permissions. Setting object permissions invovles checking a lot of boxes. For the next section we will switch to Propertybase classic and install the Salesforce Admin Check All extension for Google Chrome. Once you have installed the extension, continue with the steps below. 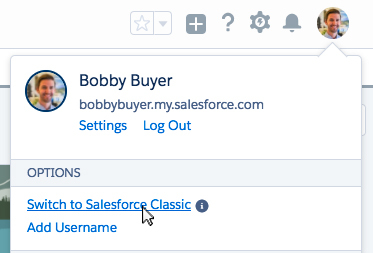 Click your portrait in the top right corner of the screen and then click Switch to Salesforce Classic. Next click Setup in the top right corner of the screen. Type 'sites' in the Quick Find menu and under Develop, click Sites. In the list of sites, click the name of your PB public API or Webservices site. In the list of Object Settings, click Accounts. Copy the settings below for Record Types, Page Layout Assignments and Object Permissions. Note: This step is where we use the "check all" box and take advantage of our Chrome extension. Using the arrow next to Accounts, switch to the Contact Object. Under Field Permissions, make sure all fields have Read and Edit Access. Using the arrow next to Contacts, switch to the Inquiries Object. Note: For the remaining objects in this section, we will leave the Record Types and Page Layout Assignments at their defaults. We will only be updating Object Permissions and Field Permissions. Copy the settings below for Object Permissions. Using the arrow next to Inquiries, switch to the Linked Listings Object. Using the arrow next to Linked Listings, switch to the Listings Object. Using the arrow next to Listings, switch to the Properties Object. Using the arrow next to Properties, switch to the Property Media Object. Using the arrow next to Property Media, switch to the Settings Object. Using the arrow next to Settings, switch to the SObject Work Queue Object. Using the arrow next to SObject Work Queue, switch to the SystemLogs Object. Using the arrow next to SystemLogs, switch to the SystemStructs Object. 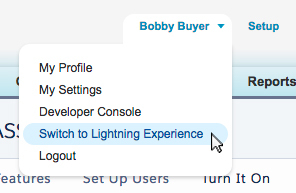 Click your name in the top menu and select Switch to Lightning Experience. Next we will assign a Propertybase license to our new site user, as well as adjust time zone and currency. Click the Assigned Users button. Click Site Guest User, PB public API or Webservices. Check the box next to Propertybase V3. One of the final steps in configuring webservices is to locate your endpoint URL. The first half of this URL is the domain name of the new webservice site we created and configured in this article. Follow the steps below to locate your endpoint URL. Under Custom URLs, in the Domain Name column, the first half of your endpoint URL will be the second domain listed. In our case this is 'pbexample.secure.force.com'. The table below lists the second half of the endpoint URL. By combining the custom domain we created in this article, with the data in the table above - we get our complete endpoint URLs for the weblistings and web-to-prospect services. Lastly we need to generate unique tokens and save them as Propertybase settings. Click here to open a free Hash Token Generator. You can use MD5, SHA-1 or SHA-256. Highlight the generated token and then copy to your clipboard. Add Propertybase Settings for both the settings listed below. 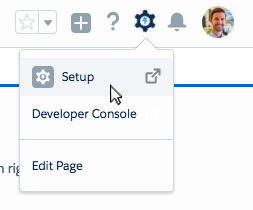 Note: Click here to learn how to add settings to Propertybase. Congratulations! You have successfully activated webservices for your Propertybase account. If you are activating this for Front Desk, send an email to support@propertybase.com with your complete endpoint URL and your tokens, so we can connect your ORG for lead capturing. At the bottom of this article are some of the features available once you have webservices activated. How do I connect to the endpoint URLs in a sandbox environment?